Predicting the future is hard, but that doesn’t stop us from trying. We’re Wired, after all. Ten years ago, we boldly declared that we’d be living with phones on our wrists, data-driven goggles on our eyes and gadgets that would safety-test our food for us. Turns out, a lot of the things Sonia Zjawinski conceptualized in our “Living in 2013” feature way back in 2003 were remarkably close to what we’ve seen. We even got the iPhone right (sort of). And so, as we look back on life in 2013 circa 2003, we’re going to spin it forward once again to tell you what life will be like in 2023. Apple redefined the desktop, laptop, and MP3 player. The next insanely great thing: an LCD arm cuff that includes a PDA, wireless Internet, a mini iPod, and, of course, a phone. 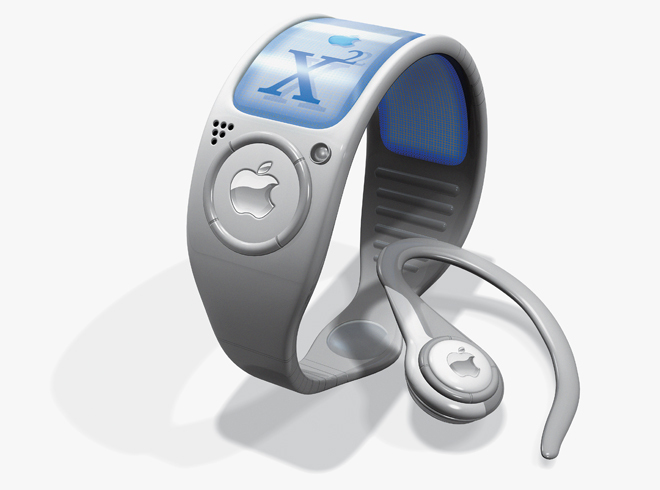 The iPhone bracelet’s motion sensor allows you to scroll through apps and files with the flick of a wrist, its clasp holds a digicam for use during video calls, and its wireless ear clip lets you listen and speak to callers. And everything can be done via voice recognition or touchscreen. Talk about the right call. Illustration: Kenn Brown. Hey, it turns out, Apple gave us an iPhone after all! We got the name right, and even seemed to know about FaceTime. But the form factor details? Not so much. While you can wear an iPod nano as a watch, or make a call with your iPhone, if you want the watch-plus-phone combination that we teased you with 10 years ago, for now you’ll need to pick up a secondary gadget that can transmit to your phone, like this Pebble. Photo: Ariel Zambelich/Wired.